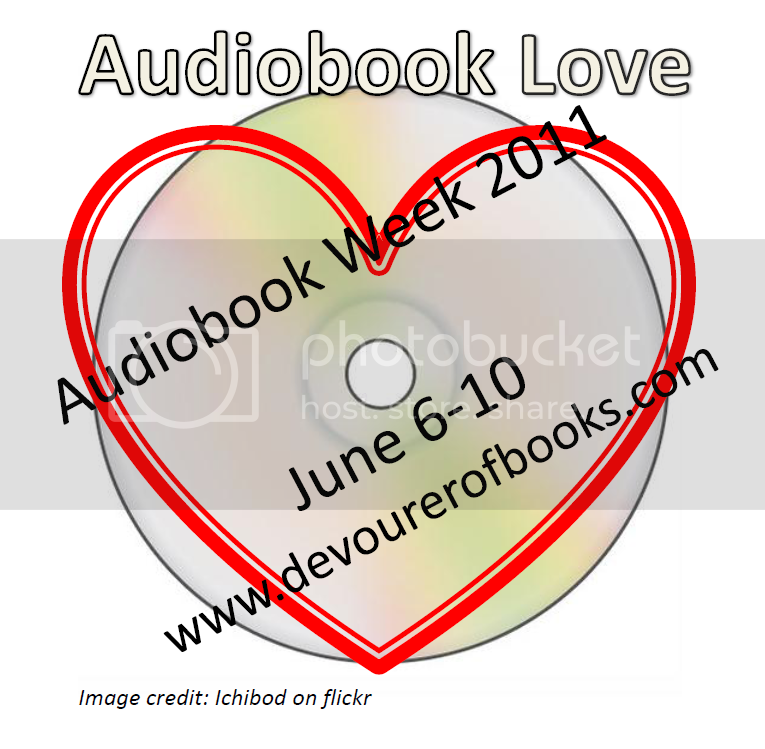 If you posted an audiobook review today, Thursday June 9th, please leave your link in the Mr. Linky before midnight Central time (US) and you will be eligible to win a prize. Andi should have everything going for her: well-to-do family, great school, brains, beauty, and musical talent. Somehow, though, none of that means anything since the death of her little brother, Truman; a death Andi witnessed and for which she blames herself. Andi is angry, at herself and at the way her parents fell apart after Truman’s death. Nearly flunking out of school and not particularly well liked by much of anyone but one friend and a guitar teacher, Andi is even considering suicide. And then she gets dragged to Paris over Christmas break by her father, who has been appointed to do the DNA testing on a heart purported to be that of Louis XVII, son of Louis XVI and Marie Antoinette. Furious at being dragged along by her father like a child, Andi is suddenly motivated to work on her senior project by the promise of a plane ticket home. At roughly the same time, she discovers a very old diary, written by a girl around the time of the French Revolution; a girl who, it seems, knew Louis XVII; a girl who was in political trouble. Alexandrine’s story begins to exert the same, or even stronger, pull over Andi as a trip home, and Andi begins to lose her present troubles in those of the past. Early on, Andi is very difficult to take. The reader truly wants to sympathize with her, after all, this girl witnessed the death of the brother she so dearly loved. The evidence is pretty clear that she wasn’t this horrible before Truman’s death. But really, Andi is horrible. She is rude, vindictive, and self-loathing, whiny, a difficult character to like. It isn’t until she gets to Paris that this begins to change. Donnelly has Andi on a very believable arc of growth, but that does require allowing her to continue to be awful just to the point where she strains the reader’s empathy. By the time Andi starts to grow, you are so relieved that you no longer have the unbearable urge to slap her, that you fall headlong into the book. Perhaps the best part about Revolution is how Andi and Alexandrine’s storylines converged. Both are fascinating and engaging, and they mirror one another in not overly obvious ways – the parallels are clearly there, but Donnelly sees no need to beat her reader over the head with them. When the storylines come together, though, that is when Revolution becomes impossible to put down. As I mentioned earlier this week, I often have trouble with the narrators of young adult books sounding too old. Emily Janice Card was probably just on the cusp of this for me. Certainly she didn’t sound quite like the seventeen year old that Andi is. After pondering it for the first 30 or 45 minutes, though, I decided she was analogous to the 30 year olds that play high schoolers in movies and sitcoms. Clearly most actual high school students don’t sound/look like that, but it is close enough that you can still suspend your disbelief. If anything, Emma Bering sounded even older than Emily Janice Card, but for Alexandrine, that worked. Both Andi and Alexandrine had been through a lot in their lives, but in Andi’s case it turned her into a petulant child, while Alexandrine was forced to mature very quickly. With this characterization in mind, the different aged sounds of their voices worked perfectly, and the fact that Bering gave Card a voice to sound younger than worked very much in the favor of the audiobook, keeping everything reasonable for girls in their late teens. Apart from possibly sounding slightly old, both women were amazing narrators, breathing life into their characters. I would not hesitate to listen to anything either of them narrated. This was an amazingly well put together book. The amount of research required, as well as the necessity to create parallels between the girls that felt natural, could have resulted in an awkward info dump, but Jennifer Donnelly wrote an incredibly moving story that was expertly narrated by Emily Janice Card and Emma Bering. You can’t go wrong with Revolution in print or audio. I was impressed with the one audiobook I listened to with Emily Janice Card, which was her father’s novel, The Lost Gate, which she co narrated with Stephan Rudnicki. I’m glad she is not just doing OSC novels now. Adults playing or narrating teenagers is a challenge. The voice gives away the age in most cases. I’ve been wanting to read this book for a while, maybe I will try it in audio. I’m anxious to read this book. Since I already have it in print, I’ll probably get to it that way. 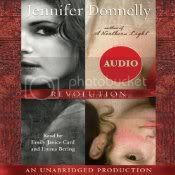 What a coincidence that I reviewed a Donnelly audio today too! I had read Revolution and was glad that Mattie wasn’t the whiny teen that Andi was. I have to read this for a committee I am on and have been considering the audio to save some time. Thank you for the review, it helps a lot to know what to expect. I can’t wait to listen to it. I just got this on audio from the library after Sandy’s rave review a few week’s back – can’t wait to get a chance to listen to it! I listened to this one too and was equally impressed. I would have loved the book in print but the audio was excellent too. You really highlighted what was so great about it!